What Can You Make Out of an Old Shirt and an Old Pillowcase? A brand new absolutely fabulous summer top! Here's what I started with ... say no more. After cutting off the top collar and part of the sleeves in a straight line, I lined the remainder of the sleeves with a thin binding made out of an old patterned pillowcase. I then inserted pleats on the back and front so that the top fitted my chest and back snuggly, and then trimmed them with a wider strip of pillowcase fabric. 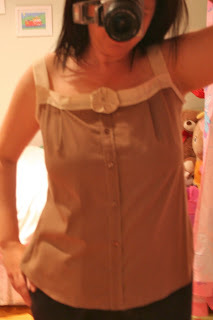 Then I sewed two shoulder straps and adjusted their length to fit my shoulders. 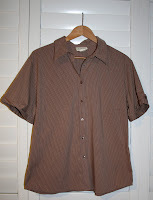 I also sewed the front button opening of the shirt closed. Finally I added a cute little ruffled fabric flower! This cute little top literally cost nothing to make and is so flattering!